What a better way to enjoy a relaxing morning than a walk on the beach. Or maybe you could enjoy a morning shellfish harvest for lunch. Thanks to toxins from plankton (paralytic shellfish poisoning or PSP) and Vibrio bacteria, many of our beaches currently have health department restrictions or advisories. 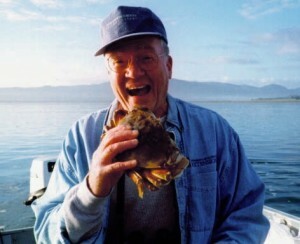 Check the Washington Department of Health Shellfish Safety website before you head out. Not only are we losing our low tides, most of us in Hood Canal, central Puget Sound and Whidbey Island area are seeing our final days of crab season. 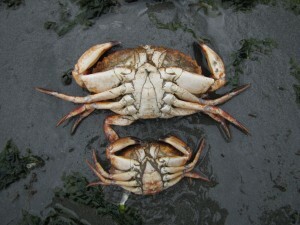 Male Dungeness and red rock crabs await the boiler, but you’ll have to catch them first. Sexing crabs is a pretty easy business if you can get them to hold still long enough to turn them over. 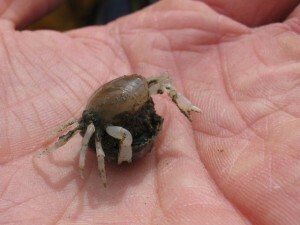 The abdomen of a crab is one of the things that separates the different groups of 10 legged crustaceans. In hermit, king, porcelain and related crabs, it’s asymmetrical, somewhat exposed and (in the case of hermits) soft enough to need a shell to keep important organs from becoming fish food. In lobsters and crayfish or even shrimp, the tail is symmetrical and large with powerful muscles. True crabs, like the graceful, red rock, Dungeness and shore crabs we commonly see on the beach, have a symmetrical abdomen that is relatively flat and tucked snugly under their body between all their legs. The male’s abdomen is narrow, generally shaped like a triangle and only fills a portion of the space between the legs. The female’s is broad, filling most of the space between the crab’s legs. This broad abdomen helps her protect her eggs while she broods them.